We begin by developing a very deep understanding of each advertiser’s product, target audience, competitive characteristics and success goals. Once we have gained that knowledge, we propose an initial media plan that purposely casts a wide net so as to learn as much as possible about what works and what doesn’t, using a limited budget. That kicks off the optimization cycle, whose purpose is to spend media money where it will reliably achieve the highest return. That’s a never-ending process requiring constant vigilance and attention to detail. The shift to digital in the buyer’s decision-making requires marketers to deliver their media and message in the right place at the right time Inform and educate whenever the prospect chooses – 24/7. Engage across digital and traditional media touch points and influence across multiple platforms and devices. 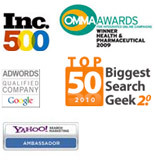 Search engine optimization (SEO) and search engine marketing (SEM) are about being there when the consumer needs you. Every request is an opportunity. Whether they are looking for your brand in particular, or a brand like yours, it pays to get there first. A comprehensive SEO and SEM strategy is the single most effective way to get your brand in front of your desired consumers and when executed thoughtfully, aligning with key KPI’s and core marketing goals, will deliver long-term, sustainable ROI. TV is still the dominant player in advertising, with consumers watching more than 4 hours per day — but screens are morphing into tablets and smartphones, and content distribution has never been more complex. We plan television campaigns for maximum impact and cost savings while also addressing modern multi-screen behavior. We are social media marketers who use our technological tools to develop strategies and execute campaigns that drive success within Facebook, Instagram, Twitter, and Pinterest. Our strategy will always come from understanding the target and identifying the insight—and be solidly steeped in the rigor of research and data. Our media campaigns build an audience engage your tribe and convert to action. Our work is driven by metrics and KPIs. We drive real insights from your web and marketing analytics. We start with an Analytics Audit then work with you to develop actionable strategies for attribution models. This highly collaborative exercise allows us to clarify and align client objectives while also establishing a framework for evaluating effectiveness. Analytics and data science is not a one-size fits all offering. It is highly customizable and consistently evolving.